Author Background - Mohit Parikh's works have been published in Identity Theory, Specs Journal of Arts and Culture, Out of Print Magazine, and the Bombay Literary Magazine. He was shortlisted for Toto Awards 2014 for Creative Writing in English. Manan is his first book. 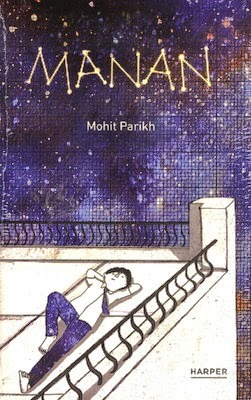 Blurb - Manan is the story of a young boy who has just hit puberty. No one around him realizes the problems that follow and he is left to deal with them by himself. It was the 23rd of April and the year was 1998. Manan, a young boy, has acquired his first official signs of puberty on this day. This is during a time when India was just entering the age of information. No one around him makes an effort to realize the magnitude of the moment. He is being teased by all sorts of temptations and does not know how to handle all of it on his own. His friends are taller than him and this is a very serious issue for him. His parents are always fighting and his sister does not have time for him anymore. So, family is out of the question. It gets worse because the person that Manan loves seems to not realize that he exists. This book will give you colorful glimpses of the middle-class India and the problems that occur in family relationships. Review - I got attracted towards the book by looking at it's cover where a boy is looking at the stars. Like the infinite stars, I made infinite expectations as the boy was trying to tell a story of a young boy and how he sees the world. The writing is easy and if you like the book you can end it in one go. Merits - The merits in the book is that the author is successful in showing the audience how a young child thinks. He has used the book to sharpen his skills in writing from a different person's perspective. The book tried to put light on the problems and biases in the society and how a young child sees them. Demerits - The book looked like a creative exercise to me rather than something which would appeal masses. I lost interest in the book many times and it was hard completing it. I think the story has nothing significant to offer. I think if you are a young guy growing up in a normal Indian household then it will seem like your story hence became really dull. It was just a day to day account of the things. The book was written in a young boy's perspective but I failed to understand why ? The problems put forward in the book are very ordinary and the self discovery that the boy was going through about the sexual life was boring and at times really irritating. Verdict - I feel a book should give something new to the reader, if not anything then at-least something to think about. I felt it failed in this thing miserably. Though there are no faults in the way the characters has been portrayed but I hardly found anything for which the book will attract the masses. The book definitely has it's positives and other people may find it interesting. I like honest reviews!!! I also like it's cover but you know 'never judge a book from its cover'. A well written review! It is extremely hard to review a book that has not impressed you at all. Still you presented such a neat and detailed review of the book. Few lines of the book that you have included in your review gives me a vague idea of the book. I liked the review but need to definitely read and then comment but however seems to be interesting enough. Thank u for the wonderful review and share.